This post begins by positing that the current colossal popularity enjoyed by the NFL is in part a result of the fact that many people would describe following the sport as "enjoyable," "fun," and possibly (to non-Jaguars fans anyway) "exciting." On the whole, it would certainly appear that professional football games are often entertaining affairs, filled as they are with momentum-shifting turnovers, kickoffs and punts returned for touchdowns, trickery like fake field goals, and other stimulating fare. While The Wall Street Journal has previously documented that NFL games feature roughly eleven minutes of action spread across the sixty minutes of regulation game time, we are in the dark as to whether these eleven minutes are equally interesting for the the 32 teams in the league. It is clear that football games do not exhibit constant levels of excitement, and certain teams may engage in more interesting gridiron activities than others. This post calculates the Net Enjoyment Tabulation (N.E.T.) for each NFL team in an effort to determine the most and least entertaining franchises for the 2011 season. I am indebted to Advanced NFL Stats for providing the play-by-play data for all 2011 NFL regular season games used in my analysis. N.E.T. is a metric that attempts to give a rough overview of the entertainment value of a given football play. It is the sum of Funness Points and Lame Points and can be expressed in utils. The higher a team's N.E.T., the more exciting plays they engaged in over the season and the more engaging their on-field actions are assumed to be. Funness Points are awarded to plays that feature scoring, turnovers, or trickery. Scoring is handled in a pretty straightforward fashion. Touchdowns are weighted more heavily than field goals, while field goals and safeties are weighted equally due to the latter's rarity. Most fans find scoring plays to be exciting and they clearly exhibit the potential to materially affect game outcomes. The NFL front office certainly appreciates the entertainment value of scoring, as the the competition committee has promoted wide open, quarterback-friendly rule changes which have helped contribute to the astronomical passing statistics currently put up by many quarterbacks. As Cam Newton fantasy owners can attest, touchdowns earned in losing efforts earn just as many fantasy points as game-winning passes. As a result, touchdowns, safeties, and field goals will be awarded constant marginal Fun Points regardless of game context. This is mainly a concession to fantasy-ification of football viewership for many fans, where scores of all shapes and sizes are welcomed by fantasy owners and are rewarded equally. For his fantasy coaches, Aaron Rodgers' 20th touchdown pass against the Lions in a given game should be just as enjoyable as his 19th. Turnovers are awarded Fun Points. Large numbers of turnovers could signal that a team is taking risks in the passing game or that they have Adrian Peterson at running back (who is one of the most exciting players when healthy). Turnovers also display the capacity to cause game-changing momentum shifts and can alter the course of a game. To fans of the team committing such turnovers, interceptions and fumbles are probably not enjoyable experiences, but they are usually seen as interesting to viewers with weaker rooting interests. Trick plays, such as flea flickers and fake punts are awarded Fun Points because while they may not always work (and yes I realize the Dolphins most certainly did not draw it up like that), they aren't all that common and most fans sensibly enjoy them. Fun Points are not enough to calculate the entertainment value of a NFL team. They must also be penalized for particular boredom-inducing sins in order to get a fuller understanding of their excitement levels. Hence, we need to add Lame Points in our calculations of N.E.T. Pro football games are generally entertaining, but they do feature some less-savory aspects which can be objectively assessed by an unbiased third party as "lame." These features are embodied in the Lame Point formula. Lame Points are awarded/penalized for plays that feature "lame penalties," punts, and challenged plays that remain upheld. Lame penalties are defined as infractions such as false starts, offsides, holding, and illegal formation. They are limited to penalties of 5 to 10 yards, as more significant penalties such as pass interference and roughing the passer can have large impacts on game outcomes and momentum. These smaller transgressions delay games and fans generally do not enjoy penalty-filled affairs. Punts are considered lame because they represent offensive ineptitude and are usually less enjoyable than conventional offensive plays. Punts fielded by Patrick Peterson and other elite returners can sometimes be entertaining, but the plays aren't consistently interesting enough to escape lame status. Kickoffs are probably less entertaining than punts on the whole, but they basically only follow scoring plays. While I support football's challenge system in general, challenges that get upheld are basically the game's equivalent of an unsuccessful sequence of pickoff moves. They simultaneously preserve the status quo while wasting the viewer's time. Watching closeups of Tom Coughlin pacing back and forth while grimacing for several minutes while losing another challenge is not really my idea of a good time. Lame Points are designed as a small complement to Fun Points more than anything else. 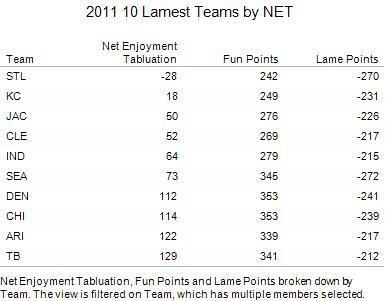 I would expect boring teams to earn their distinctions more as a result of low Fun Point values than anything else. Lame events are weighted much weaker than Fun events (reflecting the fact that football games are usually fun affairs) and while some teams may punt and jump offsides with alarming regularity, there shouldn't be that many/any teams with negative N.E.T.s. After determining N.E.T. scores for all 32 teams, I broke down the top ten teams in terms of Lameness (having the lowest N.E.T. score) and Funness (highest N.E.T. score). Figure 1, which lists the least entertaining NFL teams by N.E.T. score for the 2011 season, is pictured below. Figure 1: 10 Lamest Teams by N.E.T. According to N.E.T., the St. Louis Rams were unquestionably the lamest NFL team last season, and they actually managed the Herculean (or perhaps JaMarcus-ian is more fitting given the context) accomplishment of being the only team to post a negative N.E.T. score in 2011. In a hypothetical world where teams could play themselves, a rational utility-maximizing fan would actually experience a net decrease in utility if they were subjected to a contest between two versions of the 2011 Rams and be better off avoiding the game at all costs. Being a utility maximizing fan myself, I can't say that I went out of my way to watch the Rams all that much last season, but my experiences seem to corroborate their anemic N.E.T. performance. Every Sunday during the season my friends would have one television that would constantly show NFL Red Zone, a channel designed to show plays of consequence across the NFL. And I can honestly say I don't remember ever seeing any Rams plays. 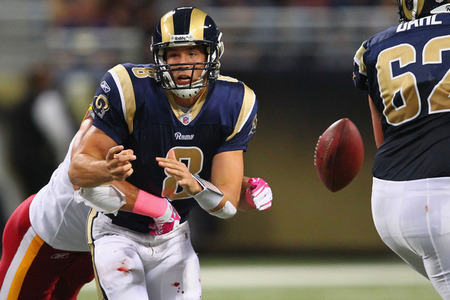 Sam Bradford's ankle injury certainly didn't help matters and Steven Jackson was the only Rams player who was relevant from a fantasy football perspective, but the fact remains that the team really wasn't all that interesting last year. The Chiefs finished second, thanks in part to injuries to key players such as Eric Berry and Jamaal Charles as well as committing a sizable amount of lame penalties. 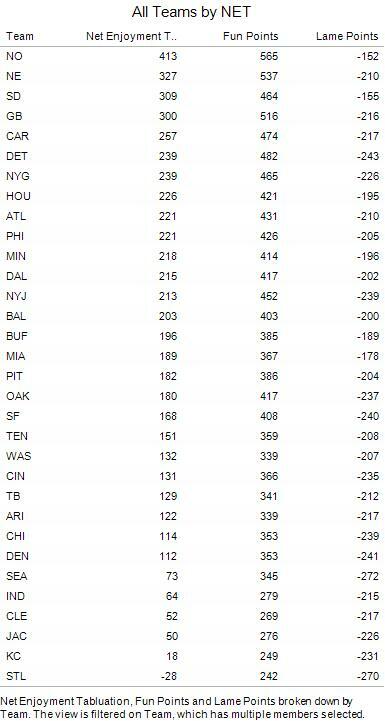 The Seattle Seahawks led the NFL in Lame Points last season (mainly as a result of high concentrations of lame penalties), edging the Rams by 2, but they avoided the ignominy of being crowned the least-interesting team in the NFL by posting over 100 more Fun Points than the Rams. I am somewhat surprised how well the N.E.T. works in measuring the excitement levels (or lack thereof) of NFL teams. Granted, the Bucanneers were interesting in a car-crash-that-everyone-stops-to-look-at kind of way and Tim Tebow's exploits skews the Broncos data a good bit. But for the result of two minutes of brainstorming and several seconds of Excel tabulations, I am reasonably pleased with the validity of this metric to assess the lameness of NFL teams. Figure 2 lists the most entertaining teams by N.E.T. The New Orleans Saints lead the pack in this statistic, having the highest Fun Point total as well as the fewest Lame Points. Again, N.E.T. seems to work pretty well. I would certainly consider these ten teams to be entertaining. It is a bit surprising to see the Chargers so high on the list, but this fits with the general trend of how they always perform worse in reality than their statistics would suggest. If anything their third-place finish offers further support for the legitimacy of the model. Given the hiring of Jeff Fisher in St. Louis and a healthy (or at least healthier) Sam Bradford, the Rams are likely to vacate their spot as the lamest franchise this season. My money would be on the Jaguars to claim the spot in 2012, though the Browns may prove to be tough competition if Pat Shurmur is especially reckless with his challenges. The Saints' suspensions resulting from their bounty shenanigans suggests that there is likely to be a reordering at the top of the N.E.T. tables as well. The Lions benefit from the fact that 15 yard penalties such as roughing the passer are not factored into Lame Point calculations and they could definitely challenge for the N.E.T. title if any one of their top running backs manages to stay healthy and unsuspended. Appendix: All NFL Teams Ordered by N.E.T.